There was a time when showing up to a party with boxed wine was a good way to get uninvited. But cubed booze has come a long way from the days of bag-slapping yore, and it's now an entirely acceptable purchase for an adult. With that accomplished, it's time to step fully into our brave new world: The era of boxed liquor is here. Which is both good and bad news. Black Box Spirits are now on tap! Just released! 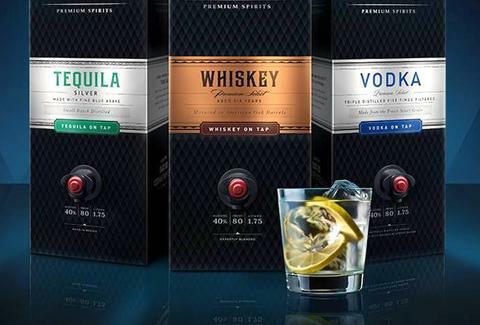 Try the new Tequila, Whiskey, or Vodka—all in convenient, packaging perfect for parties, camping, or your refrigerator! One of the brands that helped legitimize boxed wine, Black Box, is leading the charge with Black Box Premium Spirits. On offer are whiskey, vodka, and tequila, all 80 proof and sold in 1.75-liter boxes. That makes these the equivalent of a handle, double the size of a 750-milliliter bottle. They'll run $22.99 for vodka or $24.99 for tequila or whiskey. Black Box claims that compared to the top five spirits brands, you're paying 20% less. Supposedly this isn't cheap liquor either. The whiskey is “aged six years” in American Oak, the vodka is “triple distilled five times filtered,” and the tequila is "made with fine blue agave" and “small-batch distilled." As of now, the big boxes of booze are only available in six states -- Colorado, Louisiana, Missouri, New Jersey, Nevada, and Pennsylvania -- but we should be reckoning with this nationwide starting in September, and presumably for the rest of our lives thereafter.